2011 was a busy and eventful year for the publishing industry. Digital publishing grew at a rapid rate and various new devices where launched including Amazon's latest offering, the Kindle Fire. 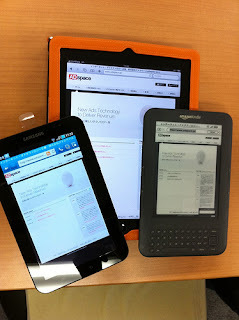 Smartphones also opened up the market and contributed to the huge increase in e-book sales worldwide. According to a recent study 63% of publishers are to go digital in 2012. Big name players like Barnes and Noble have taken their street stores to the next level with special Nook areas showing a distinct change in focus. The e-book pricing debate seems to have reached an answer too. Price should reflect the quality of the book. E-books are after all just books in e-format. It's now just a case of whether the reader prefers paperback, hardback or e-versions of their chosen title. Many authors are now published first in e-format before moving to print versions of their work. Some are specialized solely in the e-market whilst others make sure their work is available in on all platforms and in all formats. The number of authors publishing solely in print is becoming significantly less. When it comes to e-books and print, which product sells best? With so many options now available, which e-reader is most popular? The below infographic produced by The Content Wrangler gives a great overlook. Does this emphasis on e-books mean print will become a thing of the past? Not likely. Well at least not yet anyway. Where do you see the future of publishing leading? What formats are your books available in? I know that this is more of an informative post, but do YOU have any predictions about the future of ink print vs e-print? Do you think that e-readers will, in time, become the standard or do you think there is some hope for the paper purists who would prefer to see the world read between the pages? I personally think print books will be around for a long time yet. I prefer to read paperbacks esp. when reading longer books. E-versions take me longer to read for some reason and I find it harder to 'get into the book'. They work best for novellas and non-fiction as opposed to novels. Enhanced e-books could be useful for non-fiction but don't see a future for fiction. I think the e-market will continue to grow and evolve but print isn't going to disappear in the near future. It gives lots of information from this post, and i just love it.